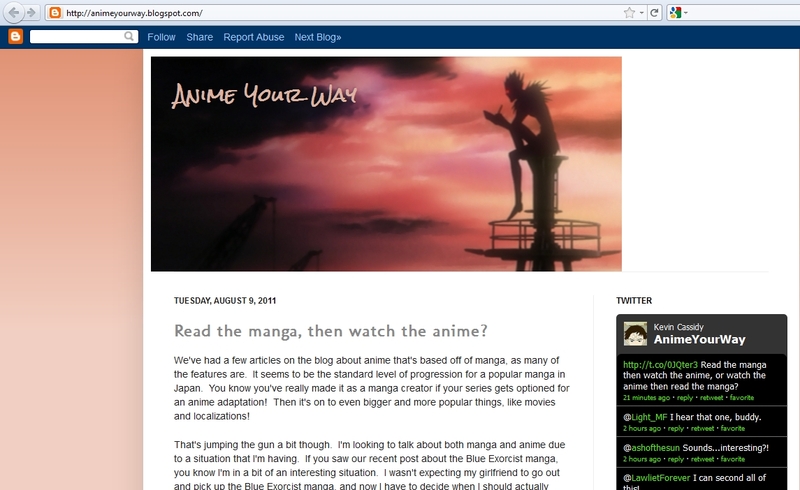 Some blogs are informative while others are great for a group of friends to talk and discuss anime. One blog I follow has a big emphasis on discussion would be Anime Your Way. RawMeatCowboy, who hosts the awesome Nintendo news site GoNintendo, started an anime blog a couple months ago that is really awesome to behold. He updates several times a day while I struggle to make an entry a day on here, and he has a lot of passion for anime. He comes up with great discussion questions and even offers some ideas of series to watch. So far, as of this writing, the community built there is really nice. I have talked to some neat people who share a passion for anime that I do and the comments are usually well-thought out and respectful of one another. Nearly every day I will at least comment on there and see what other people have to say. It is a site I don't mind sinking a few minutes into every day. The topics range from anime perceptions, to philosophical aspects that actually make me think about the art form more than I used to! Also, on Saturday nights we meet to live chat about the awesomeness that is Durarara on Adult Swim. I don't have cable, so I watch along with the DVD, but they still accept me, or at least pretend to tolerate me. After the show is over a few of us hang behind and discuss anime and games for a couple more hours. I like to call it the "Genshiken Club". I feel a sense of belonging there and there is a great sense of community not only during the chat, but also commenting on entries.